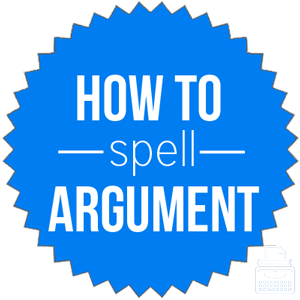 Spelling of Argument: Argument is spelled a-r-g-u-m-e-n-t. Definition of Argument: An argument is the act or process of arguing, discussing, or reasoning. When people disagree, they typically argue and state their supporting point(s), or argument, for their side. An individual might present an argument in order to convince or dissuade an audience of something. Pronunciation of Argument: Argument is pronounced are-gew-ment. What does argument mean? Argument is a noun. An argument occurs when people disagree and discuss their opinions. An argument is usually an angry or heated discussion between individuals with opposing views or points. I didn’t dare interrupt them while they were in the middle of an argument about money. I was worried that the argument would escalate into a physical confrontation. An argument is also a type of reasoning or fact or statement used as evidence to demonstrate a truth or falsehood. One might present an argument as to why something should or should not occur. The lawyer’s closing argument was good but not good enough to sway the jury. Our teacher made a compelling argument as to why this lesson was valuable to us. According to Merriam-Webster’s, the word argument was first used in the 14th century. Argument comes from Middle English from Anglo-French. Ultimately, it originates from Latin, argumentum, from arguere, meaning to make clear. There are several synonyms for argument, but some words should only be used to replace it if the context and meaning are the same. Argument is a noun with a few different but closely related meanings. In most cases, an argument is an angry or passionate discussion between people with opposing views. It may also refer to one’s belief or reason for a specific decision, action, or conclusion.